So, tonight I turned the TV on and as always at this time of year, there was absolutely nothing on. College Basketball is over, College Football is just starting their spring practices, and the NFL is gearing up for the draft. NBA basketball is…. well, who cares. In flipping through the channels I came upon a “mini” Rocky Marathon. Though, i can’t for the life of me figure out why they always stop after Rocky IV and never continue with Rocky V or Rocky Balboa (I’m pretty sure Stallone meant for those to be a comedy, right?). I watched the end of Rocky III and then watched Rocky IV in its entirety, and it left me with this question…. Which Rocky movie is the best of the bunch? Personally, I have seen Rocky III and Rocky IV more than the others, but that is only because they are broadcast more often. Where most will agree that Rocky V was a poor excuse for a cinematic sequel, I have to admit the one liners in that film are pure genius all on their own. When Rocky tells his son that Santa Claus is up on the roof with the reindeers and their “rantlers” i literally spit out my drink.. and i wasn’t even drinking anything. But as far as pure interest and entertainment goes, I think you have to throw Rocky V and Rocky Balboa out. So, which of the first 4 takes the crown? 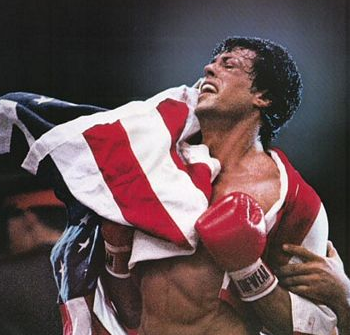 Rocky IV took an international approach, and used the tension between the USA and USSR as a plausible theme. Maybe I am biased because I am currently watching Rocky IV, but Dolph Lundgren’s Character of Ivan Drago did such a great job of playing the “monster heel” that it really made me want to beat the crap out of him. I found myself at times feelling like I was watching a real fight with no predictable outcome. The graphic fight between Drago and Apollo Creed really set the tone for the movie, and established a true “good guy vs bad guy” feel for the movie. I will have to say that the soundtrack ( and most importantly, Survivor) had a irreplaceable part of the feeling of this movie. At times I actually believed I could pick up a net full of boulders, or carry a giant tree trunk up a snow covered mountain. Throw in the modern day David Vs Goliath fight at the end, and you couldn’t write it any better… Maybe Stallone should have taken that advice and thrown in the towel right there.. I know I omitted Rocky III, but any film that uses the lead character from Mr. Nanny deserves to be left out. Casting a bleach blonde Hulk Hogan as “Thunderlips” and inserting a guy who’s real life stage name has a single letter for a last name just doesn’t do it for me. I pity the fool that did the casting for that film. In the end, I’m interested to hear what others say, please weigh in with your own thoughts on the Rocky Films. Maybe some differing views will help to sway me in another direction, because at the end of the day, “if I can change, and yous can change, we all can change”…. This entry was posted in life, Movies, sports, Uncategorized and tagged apollo creed, boxing, fighting, ivan drago, movies, rocky, rocky balboa, rocky I, Rocky II, Rocky III, Rocky IV, Rocky V, sports, sylvester stallone. Bookmark the permalink. I think that the original is the most believable and cinematically correct, but I am like you I hold a special place for Rocky IV! I saw it in the theater and its my first real Rocky memory!! I would watch Rocky thru Rocky Balboa without hesitation though! !